This wild, foggy headland north of Lincoln City won its name because cascades pour off its cliffs into the ocean. The trails to wildflower meadows here also have views of craggy islands, the Salmon River estuary, and a cove of barking sea lions. About the Hike: Three trailheads access the meadow viewpoints on this huge headland -- a lower Natural Conservancy trailhead that's open all year and two Forest Service trailheads that close from January to mid-July to protect wildlife. Difficulty: The lower Nature Conservancy Trail is a moderate 4.2-mile hike, gaining 1200 feet of elevation. The upper trail to Cascade Head is an easy 1-mile hike that gains 160 feet, and the trip to Harts Cove is a moderate 5.4-mile hike that loses 900 feet of elevation. Season: The lower Nature Conservancy Trail is open all year. The upper trailheads on Forest Service land are open only from July 16 through December 31. Getting There: If you're taking the Nature Conservancy Trail to the headland meadows from the lower trailhead, drive Highway 101 north 1 mile from the interchange where highways 101 and 18 join (just north of Lincoln City). Then turn left on Three Rocks Road for 2.2 miles and turn left to the parking lot of the Savage Park boat ramp. If you're going to the upper Forest Service trailheads instead, drive Highway 101 north from the junction with Highway 18 (just north of Lincoln City). After 4 miles, just before a crest, turn left on gravel Cascade Head Road 1861. After 3.3 miles, a guardrail on the left marks the easy, upper trailhead to the Nature Conservancy preserve on Cascade Head. If Harts Cove is your goal, drive an extra 0.8 mile on Road 1861 to a parking lot at road's end. Hiking Tips: Flower picking, hunting, camping, fires, bicycles, and dogs are banned at Cascade Head. The easy, upper trailhead to the headland meadows is closed six months of the year to protect threatened Oregon silverspot butterfly caterpillars. Even if you hike here from the lower trailhead (open all year), please stay on the trail. Even spreading out a picnic may inadvertently trample the meadow's rare checkermallows (5-petaled pink wildflowers) or the violets that serve as food for the rare caterpillars. If you're taking the lower Nature Conservancy Trail from the Savage Park boat ramp, the trail crosses Three Rocks Road and traverses the woods above Savage Road. After 0.4 mile ignore a side path to the left that leads to an old trailhead. The main trail climbs through a forest of large, gnarled spruce for 1.1 mile to a meadow with a breathtaking view across the Salmon River estuary. In the distance are Cape Foulweather and Lincoln City's Devils Lake. Then the path steepens and climbs 0.6 mile to an upper viewpoint, the recommended turnaround spot. If you decide to take the easy trail to Cascade Head from the upper, Forest Service trailhead, you'll amble through a forest of second-growth Douglas fir, spruce, and alder for a mile before emerging at the meadows. In summer expect white yarrow, plumes of goldenrod, tall pink foxglove, and Indian paintbrush. A hundred yards into the meadow the trail crests at the upper viewpoint. Most hikers will find it hard to turn back here. Remember, the farther you continue down the steep meadow trail, the farther you'll have to climb back up. A good compromise is an overlook halfway down, the only viewpoint of the rugged coves and islands to the north. If you opt to visit Harts Cove instead, park at the end of Road 1861 and hike down a switchbacking trail through a young hemlock forest 0.7 mile to a footbridge over pretty Cliff Creek. Next the path contours amid 6-foot-thick Sitka spruce and hemlock giants. A bench at the 1.4-mile mark offers a glimpse ahead to Harts Cove's headland. Don't take a brushy side path down to the left in the hopes of a better view because it doesn't have one. Instead continue on the main trail. In half a mile you'll cross a bridge over Chitwood Creek, and in another 0.6 mile you'll enter the headland's fabulously scenic meadow, once part of the Taggard homestead. Take the leftmost of several paths down the grassy bluff to find a cliff-edge viewpoint overlooking Harts Cove and Chitwood Creek's waterfall. The sea lions you hear so clearly are out of sight around a promontory. To reach the shore (on a rugged path not suitable for children), climb back up from this viewpoint 50 yards to a junction and head seaward. A scramble trail descends to the lava rock edge of the headland, where deep water gently rises and falls, exposing a bathtub ring of barnacles, starfish, and sea palms. 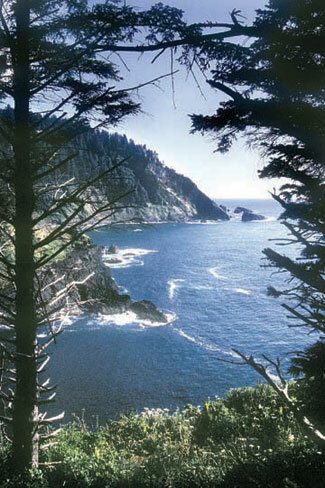 History: Cascade Head's panoramic, blufftop wildflower meadows were threatened by commercial development in the 1960s, but fans of the wild headland rallied to purchase the fragile area and donate it to the non-profit Nature Conservancy for preservation. Ironically, the impact of up to 10,000 nature-loving visitors a year now threatens the meadows' ecology. As a result, two of the trailheads are closed for six months of each year, pets are banned, and hikers are urged to stay on existing trails. Geology: As at most coastal headlands between Astoria and Newport, the massive basalt forming Cascade Head is the tip of a 300-mile-long Columbia River basalt lava flow that erupted near Idaho about 15 million years ago and puddled up at the seashore here. Subsequent uplifting of the Coast Range has worn away the softer surrounding rock.